Benefits Of Microdosing LSD And Mushrooms? Can Microdosing Shrooms (Psilocybin) Show Up On Drug Tests? Microdosing psychedelic drugs can help with a variety of psychiatric conditions. A lot of people are using microdosing to treat anxiety, depression, PTSD, Obsessive Compulsive Disorder, ADD and ADHD. Many people are microdosing to be able to perform better at work, for pain relief, to study for school and doing homework, for programming, and coding sessions that last all day. Microdosing is also helpful in working out, exercising, jogging, running, walking, and playing various sports. It helps to focus and be aware of your surroundings which is very important while engaging in physical activities. Some people even take microdoses of LSD and Psilocybin Mushrooms before attempting to learn new languages or reading books. LSD and especially Psilocybin have a unique feature. They are deeply linked with the language processing center of the brain, as using and learning new words creates images in our minds. When we associate an image with words, languages become easier to learn and to master. Prescription drug use such as antidepressants, anti-anxiety medications, anti-psychotics, mood stabilizers and cognitive enhancers may be done away with after starting a microdosing regimen. Many people have successfully treated their hard drug addiction with microdosing. 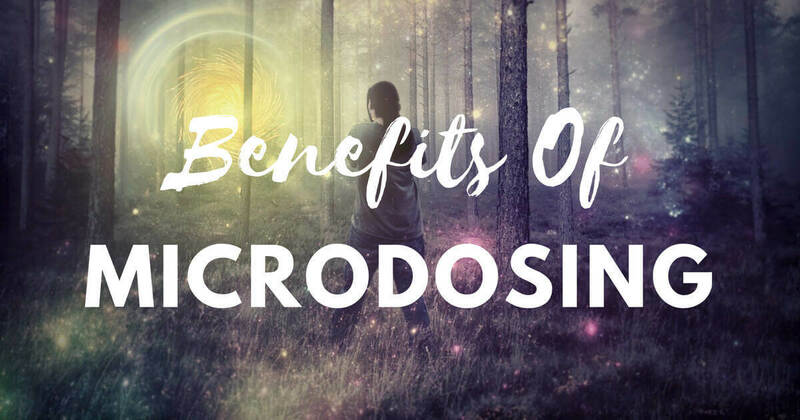 Microdosing brings out many amazing positive changes in our minds and bodies. Read our guides on Microdosing. You can safely Microdose 4-AcO-DMT for a happier and healthier mind and body. Someone taking a dose this low functions, as far as the world is concerned, a little better than normal. To date, I received no reports that sub-perceptual doses have caused any social disruption, personal upset, or any form of work-related difficulty. Instead of trying SSRI or SSNRI, it seems that trying Tryptamines (Serotonergic agonists) seems to work much better and with less side-effects of Big Pharma. Can You Microdose Your Way Out Of Depression? Seems like the answer to that question is yes. Instead of using SSRI to increase the available Serotonin in the brain, psychedelics target the Serotonin receptors directly to increase the availability. Microdosing is an Healthy Alternative for Treating Depression, ADHD, Anxiety and many other conditions. Here are some benefits of microdosing psychedelics. The Creativity Enhancing Benefits Of Microdosing are amazing. There is a noted increase in creativity. Writers, musicians, artists, and many in the Silicon Valley are microdosing regularly to enchance their creative abilities. With microdosing it becomes easy to get into the zone and stay there. There is a recognition of the natural flow within ourselves. Microdosing boosts intelligence and understanding. Intelligence also means information gathering. On microdosing you are naturally more in tune with your mind, body, and your environment. Boring tasks no longer seem mundane. Work becomes fun. If you have a boring job, you could try microdosing. Perhaps psychedelics will show you the way to be happier in another job or area of work where you find true happiness. LSD microdosing increases productivity. We can get more work done in less time. We become more efficent at what we’re doing. You have more stamina and strength. You don’t run out of breath very easily, because through microdosing, you remember to always breath and oxygenate the brain. You don’t over-exert yourself in the greed for accomplishing something. Everything is in a natural flow of the body. You have more physical and mental energy. Your endurance is increased. You can run faster and lift more weights. You can go longer when working out. Your hand to eye coordination is improved. This is essential in sports such as basketball, football, hockey, soccer, and many others. Microdosing helps with depression, anxiety and many other conditions. Low amounts of tryptamines, which bind to our serotonin receptors keep us happy. The patience we get from psychedelic microdosing allows us to examine our anxiety, and not to run away from it. However, with the patience and mindfulness we gain from microdosing, we can observe our anxieties, our fears, our worries, and try to understand why they are there. Instead of running from things that make us feel uncomfortable, we willingly face our issues, and face our fears, and understand them in depth so that we become more reselient, stronger. Voluntarily facing hardship builds our character. You create stronger bonds and increase your oxytocin levels. Oxytocin is the hormone of love, the human bonding chemical. When we hug another, or are nice to compassionate to another, there is a spike in our blood oxytocin levels. Your emotional states are well balanced and managed. As you start understanding yourself more, you find a natural peace within. This peace is not temporary, as it is not a result of some meditation or forumla, method or technique. This peace is everlasting and permanent because nature created us with a tremendous peace within our own bodies. Psychedelics bring out the natural peace and tranquility that resides in our bodies. Microdosing alleviates depression and anxiety through observation. It allows us to observe the root of our depression and the birthplace of our anxiety, to understand and then to go beyond. We will always be anxious about many things in life, and one cannot totally rid oneself of the problems, fears, and anxieties life brings. The key is knowing how to tackle such states of mind when they are produced. There is a gradual buildup of openness and awareness. You reach out to strangers more often and make more friends. You are more loving. You are kinder to your fellow human beings. There is a lack of division within ourselves which causes us to be more sensitive toward the suffering or pain of our fellow human beings, our brothers and sisters. There are moment of perfect clarity and epiphanies about oneself. You slowly begin to undrstand your place in the Universe. These moments of clarity add up to give us a larger picture of the “self” and our own “Ego”. The more we understand something, the better we can do it, right? The more we understand ourselves and our relationship to the world around us, the better we can live our lives to the fullest. You observe the wonders of life more than you did before. For example, you might stop to smell the flowers and breath in the fragrance of the freshly rained soil. You might not pluck a flower out of greed, in order to have it, or possess it, or to own it. You no longer wish for permanence in impermanent things. You are in tune with others. As your observation improves, so does your understanding of body language and how others behave around you. They say that the “Face is the index of the mind.” I say that the “Body is the cartograph of the Soul.” What we observe in the body language of others, speaks voulmes about them. Microdosing on LSD and Mushrooms is very safe. However, a few things need to be kept in mind, such as having an electronic scale, proper dosage calcultion, mindfulness, keeping a journal, and meditation. How To Microdose Acid & Magic Mushrooms dives into these points a little deeper. Some people might also be on probation or work jobs where they are randomly drug tested. People often wonder if microdosing will show up on their drug test. Below we have published well researched articles about Psychedelics and Drug Testing. This question is asked time and again, so we’ve written an in-depth article on LSD Drug Testing! Does LSD show up on Drug Tests? Read this article for more information on Do Shrooms Show Up On Drug Test?